The online marketing firm Yodle plans to double its Charlotte workforce to about 250 people. The company opened its new offices today in the University area with room to hold the new employees. That may seem unremarkable, but it is unusual for Charlotte. 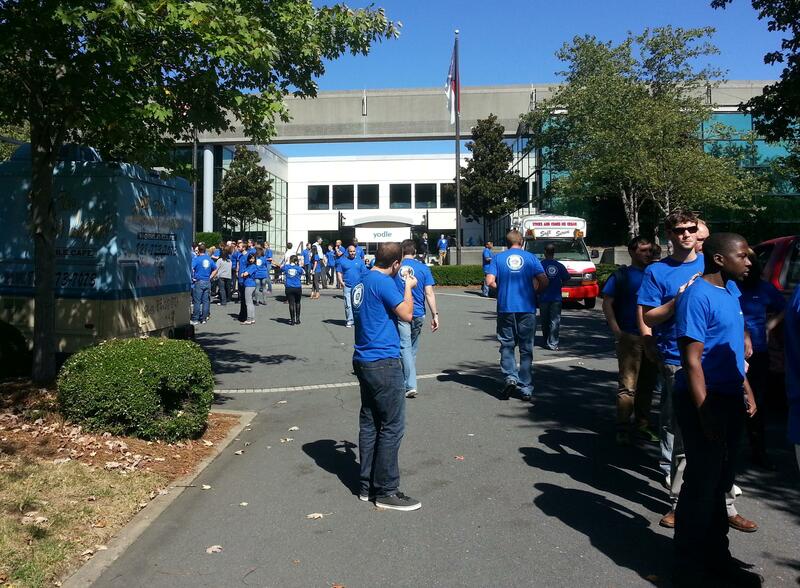 Employees gather outside at the opening of Yodle's new offices in Charlotte. Yodle is a classic tech start-up, the kind usually associated with Silicon Valley or New York. Inside the new offices, employees in blue company t-shirts play Foosball, shuffleboard and air hockey. The company helps businesses attract traffic to their web sites. It grew from about 30 people in New York and four in Charlotte in 2007. Today’s there more than 1,100 employees in five offices nationwide, with about 10 percent of that workforce in Charlotte. Now the company plans to double that, without encouragement from tax incentives. CEO Court Cunningham says Charlotte is low-cost, with large, well-educated labor pools. Also, he likes the personality. The investment is sizeable in a region not known for its venture capital-backed tech firms. The companies in the area tend to be larger, often serving the finance or health industries. And, a few local incubator programs foster much smaller, homegrown start-ups.